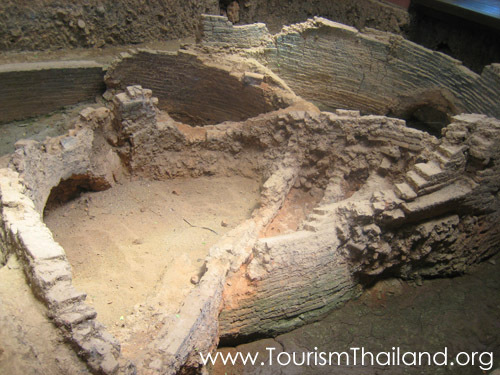 Located at Ban KoNoi around 4 kilometersto the north of Si Satchanalai, this kiln sitehas more than 500 limestone kilns thatwere discovered along with other numerous celadon wares and pots which are still in the perfect condition. As for the kiln, most arein the shape of oval with the curved roof and is 7-8 meters in width. The centreis split into two buildings which are built to cover the kilns number 42 and 61. Also inside the centre, there are exhibitions of ancient artifacts and the evolution of ancient ceramic wares. Getting there: Head to the north of Si Satchanalai Historical Park to Ban KoNoi around 6.5 kilometers where there’re remains of ancient kilns. Otherwise, use the provincial highway No. 1201 from Amphur Si Satchanalai, drive approximately 7 kilometers to Ban KoNoi and the centre is on the left.